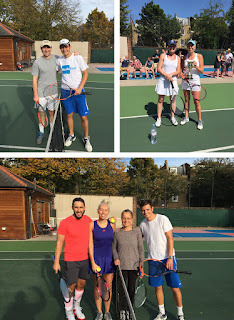 Butterfly Tennis Club - Membership Subscriptions 2019-2020 are now due. 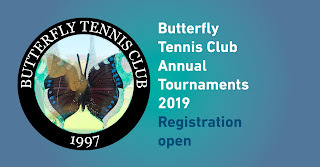 Your 2019-2020 Butterfly Tennis Club annual subscription is now due. The membership year will run until 31st March 2020. The payment system is the same as last year, so you will pay via Stripe using any debit/credit card. To pay, please login to the booking system website, click "Membership Subscription" on the left side, and follow the instruction to pay online with your card. If you have forgotten your login details, please click the following link to use the Forgotten Password process. The payment deadline is Thursday 21st March 2019. Any members who have not renewed by that date will have their memberships deactivated on 1st April and will not be able to reactivate until the first week of May. The code for entry to the courts will also be changing in early April. May I remind everyone the Club is run by volunteers and it makes life much easier if people renew within the deadline. It will only take you a few minutes to do so. Please help by renewing in a timely manner. There will be less flexibility this year in allowing for renewals/new members throughout the season to reduce the administrative load. All Family groups from last year have been copied across. Only one member of the family needs to make payment. Please note the Club is considering the installation of floodlights and the resurfacing of the courts during this membership year. This could lead to the Club being closed for 4-6 weeks. Members will not receive any refunds or compensation were that to be the case. Any court closure will not occur during the summer months. 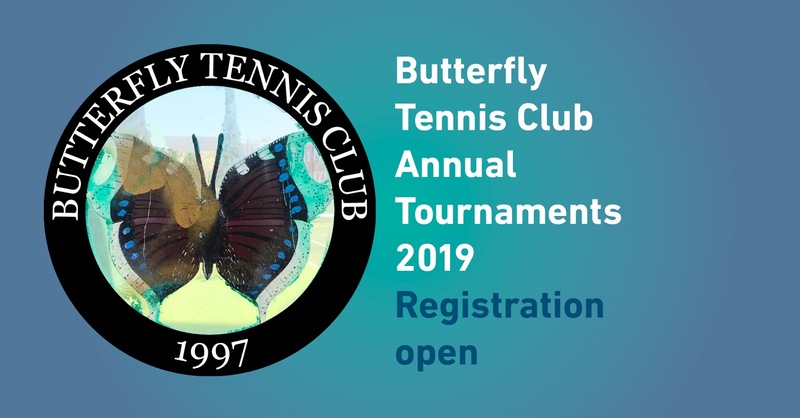 The Butterfly Tennis Club will once again be hosting Annual Tennis Tournaments in 2019. Registration open until 21st March. The Tournament Director this year is Julian Parsons, and he will be assisted by me. Please contact Julian on jp25bal@gmail.com for any queries. We will be contesting Men's and Ladies' Singles, Men's and Ladies' Doubles and Mixed Doubles Tournaments. The caveat for hosting all tournaments is that we need a minimum of 8 singles participants or doubles pairs. If there isn't enough interest the tournament will not take place. The Registration Deadline is Thursday 21st March. Please register your interest via the MyCourts booking site, by clicking on the "Tournaments" button at the top and choosing the tournament of interest. There is no cost for entering the tournaments. The Tournament Draws will be made by the Tournament Director, Club Chair and anyone else who would like to be present as soon as possible after the Registration Deadline. Exact time and place will be notified in advance. Seedings will be determined by the Tournament Director based on current form. The Tournaments will begin on 1st April, and we will aim to have the Finals weekend at the end of June. Hopefully we can replicate the great success of the Ladies' Singles Final last year. This year there will be a much stricter adherence to deadlines, with enforced coin-tosses to decide matches which aren't played by the required deadlines. All the matches will be best of 3 tie-break sets. The Singles Finals will have an umpire and line judges and the doubles just an umpire (subject to volunteer availability). The Club will provide tennis balls (Wilson US Open) for the Finals. Players must provide balls for all other matches. There are a lot of new members who have joined the Club this season, and I encourage everyone to get involved. I would especially like to encourage the Ladies to enter the Singles and Doubles. We have never had a Ladies' Doubles before, so it would be great to get it started. The Ladies' Singles has often struggled for numbers, but I know we have many good players at the Club, so please sign up. It will be fun! If you would like to enter one of the Doubles Tournaments but don't have a partner, please sign up online and send Julian an email. We will do our best to find you a partner. The Club will be hosting a Social Evening and Trophy Presentation for the winners of the 2018 Club Tournaments on Friday 18th Jan from 8pm, upstairs at the Crooked Well. The Butterfly Tennis Club will once again be hosting Annual Tennis Tournaments in 2018. The registration deadline is 27th April. Please register your interest via the MyCourts booking site, by clicking on the "Tournaments" button at the top and choosing the tournament of interest. There is no cost for entering the tournaments. The Tournament Draws will be made at the Open Day on 28th April after the AGM and Wimbledon ticket draws have taken place (around 4pm). The Tournaments will begin on 30th April, and we will aim to have the Finals weekend at the start of September, or sooner if possible. The Singles Finals will have an umpire and line judges and the doubles just an umpire (subject to volunteer availability). The Club will provide tennis balls (make to be determined) for the Finals. Players must provide balls for all other matches. Last year there was a lot of chasing that went on to get matches played. I could use some help with that. If any member would like to help me run the tournaments this year with a view to taking on the responsibility in 2019, please let me know. I look forward to seeing all the entries flooding in!! On Saturday April 28th, the Committee will be hosting an Open Day, AGM, Wimbledon Draw, and Tournament Draw from 1-4pm. Open Day – this is a chance for members and non-members to come along to meet new people, play some social tennis, meet Coach Matt Bennett and see how some of the drills work. A very loose plan is to have one court of social doubles from 1-3pm, one court with Children's Drills 1-130pm followed by Adult Drills 130-2pm and after that letting anyone who wants to play on both courts. AGM – at 3pm we will host the Annual General Meeting. New officers will be voted onto the Committee, a review of the Club's finances will be held and other matters will be discussed. Wimbledon Draw – shortly after the AGM the annual Wimbledon Draw will be done by Hugh Brown. Those who followed his instructions earlier in the year with regard to LTA registration and opting in will be eligible to enter the draw. Names will be pulled from a hat. Tournament Draw – every summer the Club hosts Ladies' Singles, Men's Singles, Men's Doubles and Mixed Doubles tournaments. If there is demand we would also host Ladies' Doubles. Registration to commence shortly and will end on 27th April. The seedings and draw will be made then so the tournament can start in May. 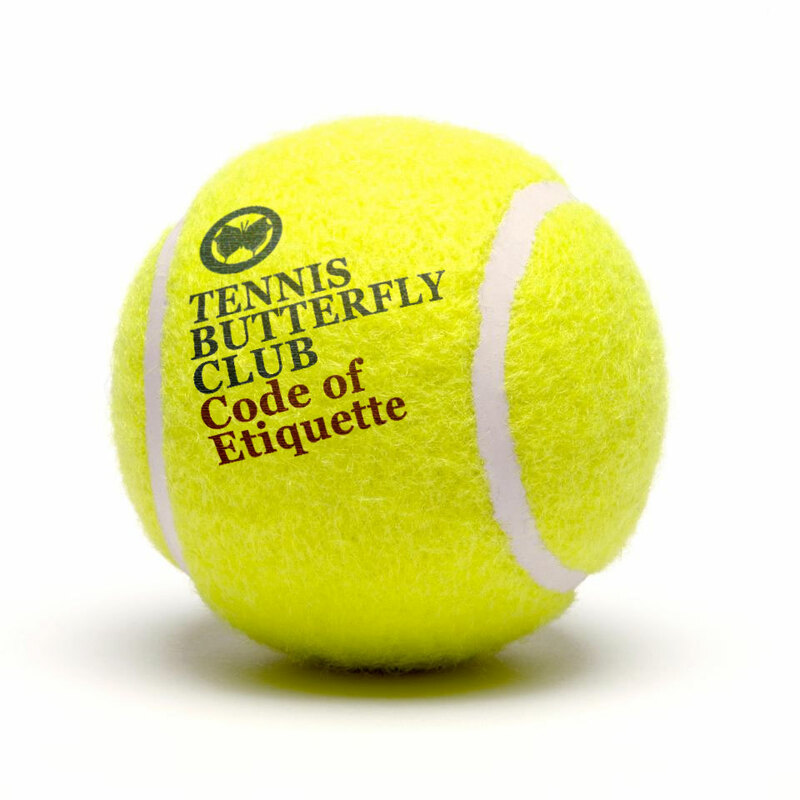 As well as our Club Rules we’d like to remind members of our concise but important Code of Tennis Etiquette. We are a small, unique and friendly club. Sportsmanship and consideration has always been part of the Club ethos, and members are expected to be friendly, polite, considerate at all times. Often a ball from another court will end up on your court. To return a ball simply roll it safely to the back of the court, and not direct to a player unless he/she requests it. Please also wait for a break in play before asking for a ball back. Please respect the other court's space, whether playing a match or using the practice wall, try not to encroach into the next court while a point is being played. Be considerate while using the practice wall to not interfere with the play on Court 1. Keep noise to a reasonable minimum. Do not walk behind a court during an active point, pass as quickly as possibly after a point has finished. Even if their time is up, allow the players with a booking before yours to finish a final game, within reason. Wear proper tennis trainers with a non-marking sole, as other shoes may damage or mark the court. Please lower the nets at the end of the day. Please pick up balls and leave them in the yellow balls bin for recycling if you no longer need them. Please take rubbish home with you - there are no bins on purpose and members should take all rubbish home with them. This applies especially to the ball can ring pull tops as they are often left around the courts and can cause injury (if a child where to pick one up). Please try not to swear, whatever the language, we are a diverse and international community. Please cancel bookings in good time if you don't need them to free up the courts for others. Butterfly Tennis Club would like to clarify the Court Booking Rules. The Members are self-policing with the Bookings. Members will be warned (by the Bad Cop) if they don't adhere to the policy and if are found to continue abusing the system, will have Booking Rights removed for a 2 week period in the first instance. We are a Community Club and are trying to ensure fair playing time for all. Thank you for your understanding and collaboration. Monday to Friday, 9am-5pm, excluding Bank Holidays (bookings must finish by 5pm). A maximum of 2 hours if playing another member (please input the other Member’s name in the booking) or 1.5 hours if playing a guest. All guests are welcome but would be expected to join if they play more than 3 times in a Membership Year. Individual/Family/Concession Members may have a maximum of 2 Booking Slots in the system, of which only 1 Booking Slot can be at Peak Times. To be clear, Members may have one Peak and one Off-Peak booking OR two Off-Peak Bookings in the system at any one time. Off-Peak Members may have a maximum of 2 Off-Peak Booking Slots in the system at any one time.